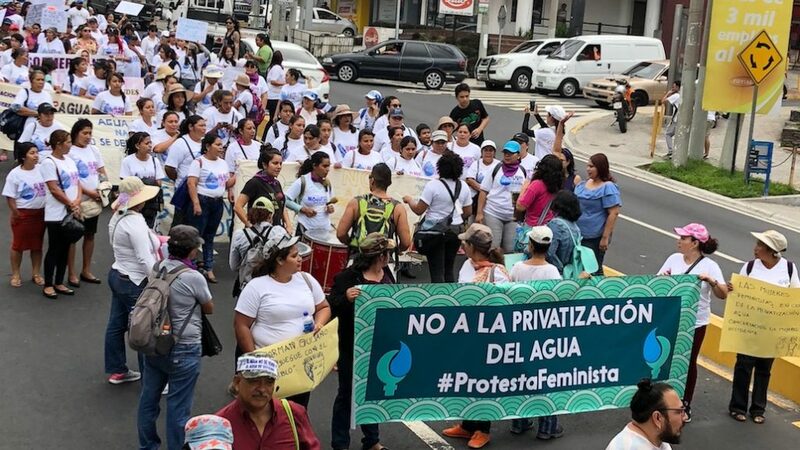 Salvadoran social movement organizations have unified across sectors in an urgent response to the right-wing’s most recent efforts to privatize the country’s scarce water resources. Joined by academic and religious institutions, environmental and community organizations are organizing marches, demonstrations and community forums to put pressure on legislators to protect the country’s water and to raise awareness of this long-standing struggle. Despite water sources being plentiful in El Salvador, over 90 percent of surface water is contaminated due to industrial pollution, overuse for commercial purposes and an absence of national regulation. Local disputes, or water wars, have become a common occurrence throughout the country as vulnerable, underserved communities struggle to obtain and maintain access to the water they need to survive. For years, environmental organizations and the broader social movement, supported by the leftist political party, the Farabundo Martí National Liberation Front (FMLN), has sought to protect this vital resource and to ensure its equitable distribution through the proposed “General Water Law,” which was originally introduced in 2006. Among other goals, the General Water Law would define and protect water as a human right to water, ensure universal access for the population, and integrate community consultation into national decision-making regarding water use. In consultation with the National Water Forum (Foro del Agua), a broad coalition of environmental, community, health and human rights organizations, the FMLN introduced an updated version of the law in 2013 in the Environmental and Climate Change Commission of the Legislative Assembly and pushed the debate forward. Ninety-two articles had been approved before the discussions ground to a halt when right-wing parties insisted that the private sector be brought in to the new regulatory bodies proposed by the law. Now that the right-wing parties have a super majority in the legislature following the 2018 elections, they are taking swift steps to pass their own proposal, the “Comprehensive Water Law.” The arch-right Nationalist Republican Alliance (ARENA) introduced the bill in June 2017, alongside El Salvador’s most powerful business lobby, the National Association of Private Enterprise (ANEP) and other right-wing parties. With the “Comprehensive Water Law,” the right-wing seeks to undercut the heroic work of water defenders, academics and religious institutions, including the Catholic Church, who have effectively halted right-wing efforts to privatize water since 2006, demanding urgently-needed public regulation instead. As in the past, El Salvador’s social movement has responded to the threat with inspiring actions in the street. Days after the Environmental Commission started to approve articles of the Comprehensive Water Law, religious, community, environmental, youth and women’s organizations marched in San Salvador on June 7 for the 18th Annual Ecological Walk to celebrate the United Nations’ World Environment Day. Participants called on the Environmental Commission to halt their steps toward privatization, demanding that they instead pass the “General Water Law.” The ecological walk ended at the gates of the Legislative Assembly, where it was met by a second march led by unions, agricultural cooperatives, and other community groups. On June 14, the University of El Salvador (UES), the country’s only public institution of higher education, which has a long history of militant struggle, shut down for the day, with students, faculty and staff marching to the Legislative Assembly to present their demands for the defense of water. They were joined by community organizations in a mass mobilization, attended by several thousands of people, demanding that their voice be included in the Environmental and Climate Change Commission’s discussions and that the commission halt its efforts to privatize water and instead follow through with the passage of the social movement´s General Water Law proposal. Chaos erupted briefly at the end of the otherwise peaceful and highly energetic march, when UES president Roger Arias and other university leaders who had arranged to formally deliver the University’s demands were denied entry at the gates and were instead pepper sprayed along with students, teachers, workers and members of the media by private security. The crowd dispersed after some demonstrators responded to the attack by throwing rocks at the windows of the Legislative Assembly. The UES leadership was later allowed to deliver the correspondence with their demands but is demanding an investigation of the repression, which ARENA’s Norman Quijano, President of the Legislative Assembly, and Alberto Romero, the leader of the ARENA’s parliamentary group, have been accused of directing. 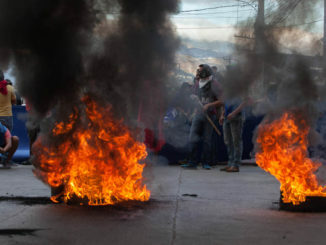 On June 16, a mass mobilization of several thousand again took to the streets in San Salvador to continue to put pressure on the Legislative Assembly. 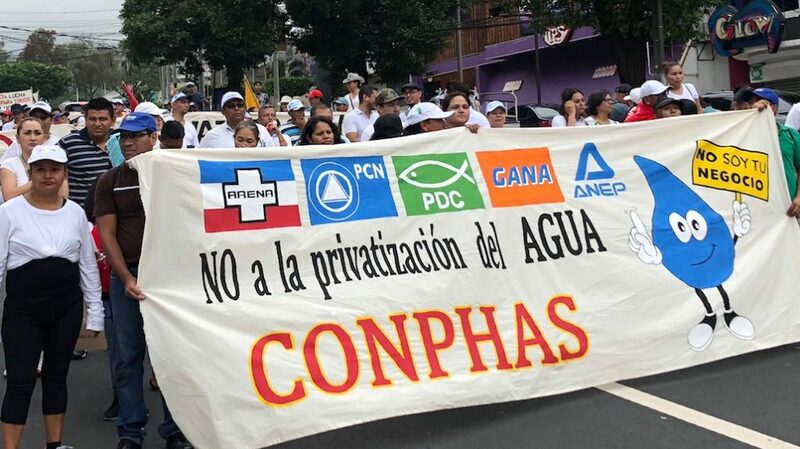 This march was organized by the National Alliance against Water Privatization with support from environmental organizations, university student organizations, labor unions, feminist organizations, and religious groups. 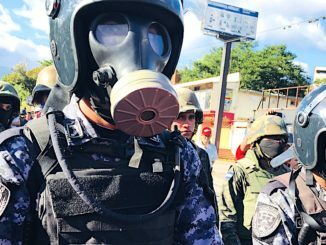 Marches have spread throughout San Salvador and to other parts of the country, including in the departments of San Miguel, Morazán, Chalatenango, Cuscatlán and others. The Universidad Centroamericana, José Simeón Cañas (UCA) and the UES also hosted informative water forums that were widely attended and shared on social media. The Catholic Church has been outspoken against corporate control over water. As Archbishop José Escobar Alas stated during a recent press conference, “We do not believe that private business should have majority control over [water] resources; it should be the state.” Meanwhile the Episcopal Conference issued a statement expressing, “As pastors, we are witnesses to the clamor of our people, who are calling for clean water in every home and who cannot pay the cost if this vital resource were to be turned into a commercial good subject to the rules of the market.” The alignment between the religious sector, the environmental movement and the broader social movement could play a determining factor, much as it did in the successful fight to ban gold mining in El Salvador. 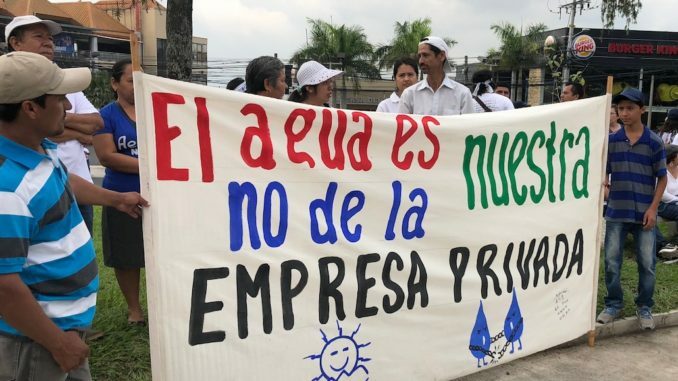 The nationwide popular support for these actions are a testament to the urgency of the issue of water access in El Salvador and to the significance of the fight that environmental and community organizations have been engaged in for over a decade to protect water from corporate control. The undeniable consensus coming from the social movements and civil society around this issue has had a hopeful impact. On June 26, the Environmental Commission agreed to open forums of debate. Additionally, many right-wing politicians have been forced to publicly explain their positions on the issue, including ARENA’s 2019 presidential candidate, Carlos Calleja, who has conceded to the fact that having private sector representatives within the decision-making body would lead to a conflict of interest. Francis Zablah, one of the representatives from the Grand Alliance for National Unity’s (GANA) on the Environmental Commission, has also officially demanded that article 14 of the proposal, which concerns the makeup of the Board of Directors, be taken out of the commission’s discussions, assuring his supporters that he will not vote to approve privatization. Yesenia Portillo is a Salvadoreña born and raised in Southern California where she helped found the Cispes-LosAngeles chapter. 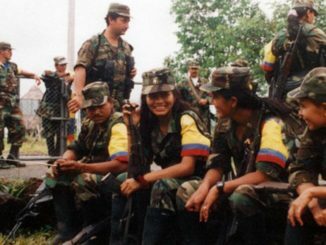 She is currently in El Salvador doing research on right wing efforts to privatize water and criminalize water defenders.